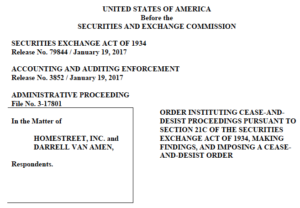 On January 19, 2017, the U.S. Securities and Exchange Commission (“SEC”) sanctioned HomeStreet, Inc. (“HomeStreet”) for violations of SEC whistleblower confidentiality protections. Substantively, the SEC found that HomeStreet had committed certain accounting violations. In addition, HomeStreet impeded employees who were involved in or knew about the accounting practices from communicating directly with the SEC. HomeStreet believed that an SEC investigation into its accounting practices may have been initiated by an SEC whistleblower tip. One of the ways in which HomeStreet “acted to impede individuals from communicating directly with the Commission staff about a possible securities law violation” was by pressuring employees to reveal the identity of the presumed SEC whistleblower, in violation of SEC whistleblower confidentiality protections. HomeStreet also used severance agreements that required departing employees to waive their rights to receive SEC whistleblower awards, in violation of other SEC whistleblower protections. The accounting violations occurred in HomeStreet’s Treasury department. Three employees of that department reported their concerns to both HomeStreet’s Human Resources department and to a HomeStreet executive. The SEC’s Order identifies that executive as “Executive A”. The three Treasury department employees and Executive A informed HomeStreet’s senior management about the employees’ accounting concerns. In April 2015, the SEC served a voluntary document request on HomeStreet related to the accounting issues. According to the SEC’s Order, HomeStreet assumed that the SEC’s document request “could have been in response to a whistleblower complaint”. In contravention of SEC whistleblower confidentiality protections, HomeStreet “began taking steps to determine the identity of the presumed ‘whistleblower’”. Two of the Treasury department employees resigned. A senior executive at HomeStreet asked the remaining employee whether he had blown the whistle to the SEC. The employee responded that he had not. The senior executive then asked the employee whether he knew who the SEC whistleblower was. When that last remaining Treasury department employee resigned, at his exit interview a different senior executive told the employee that he believed the employee “knew who had ‘done this’ to the Company”. Later, that same senior executive who had been at the Treasury employee’s exit interview asked Executive A if he was the SEC whistleblower or, if not, if he knew the identity of the SEC whistleblower. Executive A responded that he was not an SEC whistleblower and that he did not know the SEC whistleblower’s identity. After Executive A resigned from HomeStreet, the SEC requested that he provide information to it. Executive A sought indemnification from HomeStreet for his legal fees in connection with the SEC’s request. In negotiations over the indemnification, a lawyer for HomeStreet suggested that the terms of the indemnification agreement could allow HomeStreet to deny indemnification to a whistleblower. (1) [Executive A] stands by his representations to HomeStreet and to me that he did not initiate or trigger the current SEC investigation by bringing the matter to the SEC’s attention; and (2) you are unaware of any facts that [Executive A] brought the matter to the SEC’s attention or caused others to do so. Executive A’s counsel refused to provide this confirmation. Even though HomeStreet did not get the confirmation, it did pay Executive A’s legal fees. However, by taking actions to determine the identity of an individual whom HomeStreet suspected had brought the hedge accounting errors to the Commission staff, including suggesting that the terms of an indemnification agreement could allow them to deny payment to an individual who HomeStreet believed to be a whistleblower, HomeStreet acted to impede individuals from communicating directly with the Commission staff about a possible securities law violation. In a press release about the case, the Director of the SEC’s San Francisco Regional Office reinforced SEC whistleblower confidentiality protections, stating, “Companies that focus on finding a whistleblower rather than determining whether illegal conduct occurred are severely missing the point”. This release shall not prohibit Employee from … discussing any matter relevant to Employee’s employment with any government agency with jurisdiction over the Company but shall be considered a waiver of any damages or monetary recovery therefrom. Severance agreements containing this provision were used “at least two times, in April 2016”. The SEC acknowledged that HomeStreet took certain remedial actions, including: (1) implementing certain accounting changes, (2) ceasing the practices that gave rise to the accounting concerns at issue in the case, (3) implementing enhanced oversight by its Accounting Department, and (4) hiring a Chief Financial Officer. Employee understands that nothing in this Agreement limits Employee’s ability to file a charge or complaint with any federal, state or local governmental agency or commission (“Government Agencies”). Employee further understands that this Agreement does not limit Employee’s ability to communicate with any Government Agencies or otherwise participate in any investigation or proceeding that may be commenced by any Government Agency including providing documents or other information without notice to the Company. This Agreement does not limit the Employee’s right to receive an award for information provided to any Government Agencies. (3) provide them with “a statement that HomeStreet does not prohibit former employees from reporting information to the Securities and Exchange Commission or from seeking and obtaining” SEC whistleblower awards.